NEW UPS5000-S Series UPS EXCEEDS 97% ON LINE EFFICIENCY! The UPS5000-S series of modular UPS Systems is the latest generation of advanced modular UPS systems from HUAWEI Technologies. Based on the company’s extensive experience in digital technology and power electronics. The system benefits from high-performance DSP and high-speed communication technology. 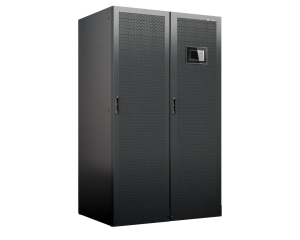 As a result of this, the UPS5000-S system meets the increasing demand for lower operating costs and overall reductions in TCO. This is achieved by the systems unsurpassed levels of on-line, double conversion efficiencies of >97%. The architecture of the system provides a fully hot swappable capability of; power, static switch and energy control modules. Consequently, the system doesn’t require the need to transfer the critical load onto the bypass. Additional features include; Intelligent hibernation of power modules. This automatically adapts to the varying load levels while maintaining levels of redundancy and continued system availability. Furthermore, the UPS5000-S also features; the iPOWER function. This continuously monitors the systems key components for ageing, therefore, providing advance notification of their subsequent replacement throughout the lifecycle of the system. Output power factor is 1 (kVA=kW). Systems are available in 6 frame sizes and have an output power range from 50 to 800kVA/kW. Customers can connect up to 8 frames in parallel and in addition, they can also configure the systems for DUAL BUS operation. Therefore, to find out more, call us now on 0845 130 6118, or alternatively, you can drop us an email enquiries@sielenergy.co.uk. Please Click here to download the UPS5000-S brochure.